Certified International's "Gilded Rooster" ceramic dinnerware and serveware is designed by Susan Winget. Four assorted colorful roosters are featured on mix and match dark and neutral backgrounds, highlighted with golden architectural details and antique farm ledgers. The fanciful 3-d rooster ceramic cookie jar and S&P shakers are a unique addition to any countertop or table. Dimensions 18.33 In. X 18.33 In. X 17.33 In. To be honest, these are still in the box, but I have looked at them and just love them. 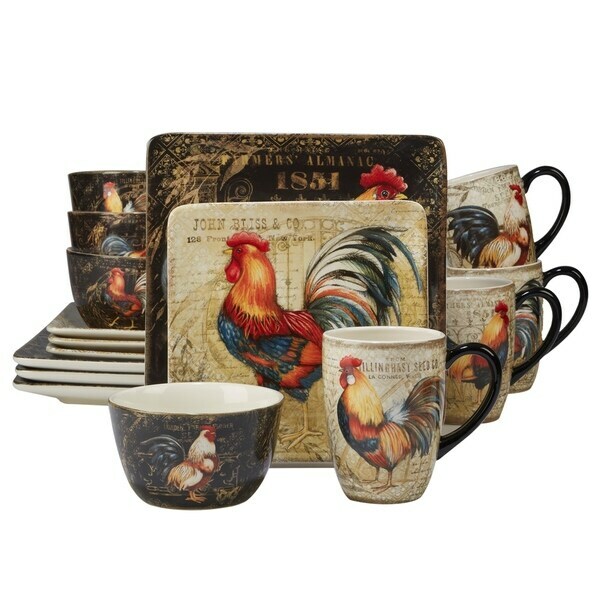 I have 3 different sets of rooster themed dishes from Overstock that I rotate out each month, so these will be on my table soon. I love that there are actually different color combinations on each dinner plate, salad plate, bowls and cups. Makes for a beautiful presentation. Can't wait! I absolutely love the design. 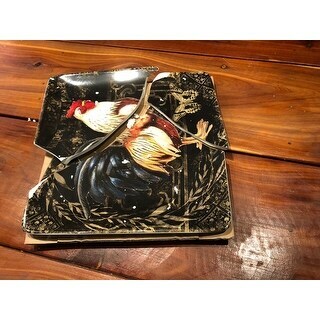 These dishes are so striking with the roosters being very prominent against both the light and dark colors. Very sturdy and easy to clean. My mother saw them and said that she really liked the coffee cups because of the height and the ability to keep her coffee hot. Dinnerware arrived before due date, all dishes were in one piece. They are pretty and very nice size, I can use the smaller plate all the time. The bigger one is huge. My 4 year old grandson told me I could hang one on the wall but we have to use the others. They did not get hot in microwave. Overstock had the best price. The dishes are beautiful but one of the plates were broken. I ordered these for my wife as a Christmas gift. I was very pleased as to the quality of the packing and also as to the quality of the product. I gave this to my Sister today as an early Birthday present and she LOVED the set. It is a very beautiful set. i bought this for my mother as a birthday present and she loves it! These dishes are beautiful and sturdy. Worth every penny. I will be ordering another set!! More beautiful than the others dinnerware set.